On July 5, 2018, Airbus SE, the European aerospace giant won two studies orders from the ESA to design the "Sample Fetch Rover" and an "Earth Return Orbiter", critical for retrieving Martian soil and rock samples to Earth before the end of the next decade. The results of the entire mission studies will be presented at ESA’s council at ministerial level in 2019 for a decision to continue developing these missions and also, necessary approvals will be sought. The missions will constitute 3 launches, which will be executed by NASA and the ESA as part of a joint statement of intent, signed in April 2018 between Thomas Zurbuchen, NASA Associate Administrator for Science, and David Parker, Director of Human and Robotic Exploration Programs at ESA. Both space agencies agreed to "develop a joint Mars Sample Return (MSR) plan and to complete the studies needed to reach the level of technical and programmatic maturity required to pursue an effective MSR partnership." The clearly outlines the potential roles of each space agencies and how to mutually support each other in this collaborative space mission. NASA would lead as a "systems architect" and provide MSR lander (SRL) mission which will collect samples, do the necessary handling, and deploy a containment system for the orbiter as well as the reentry vehicle. Whereas, ESA would lead MSR orbiter mission, provider "Sample Fetch Rover" and Sample Transfer Arm to SRL mission. NASA’s Mars 2020 Rover mission, is set to collect surface samples in 36 pen-sized canisters (sample tubes) as it explores the entire surface of the Red Planet. These canisters will be filled and readied for a later date pickup. The Mars 2020 design is based on NASA's successful Mars Science Laboratory mission architecture, including its Curiosity rover and proven landing system. 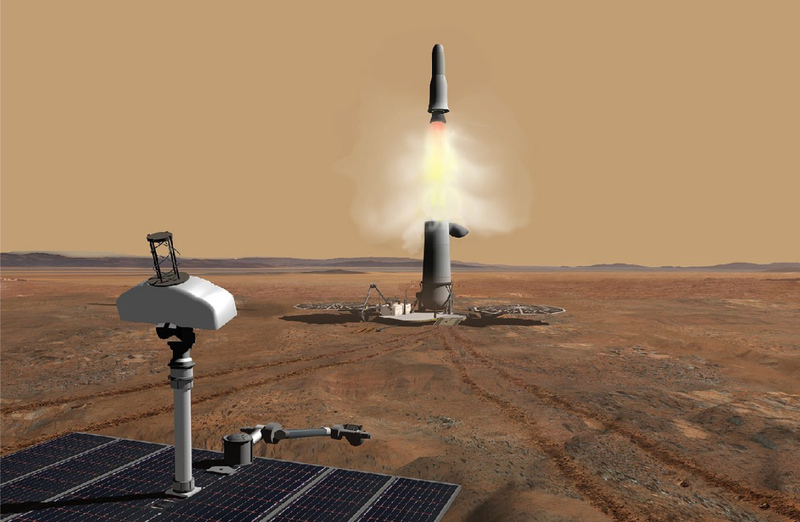 In the same year, 2020, ESA’s ExoMars Rover will be delivered by a Roscosmos-built lander (a Proton rocket will act as an ExoMars 2020 surface platform) on Mars' surface and will drill up to two meters below the surface of Mars in order to search for evidence of life. It will include an infrared spectrometer to characterize the mineralogy in the borehole. Once collected, a sample is delivered to the rover’s analytical laboratory, which will perform mineralogical and chemistry determination investigations. Of special interest is the identification of organic substances. The rover is expected to travel several kilometers during its mission. The ExoMars Trace Gas Orbiter (TGO), part of the 2016 ExoMars mission, will support communications. A second joint mission between NASA-ESA would land a small "Sample Fetch Rover" nearby and retrieve the canisters filled by NASA's Mars Rover. This rover would take samples back to the landing site and the lander to place them in a Mars Ascent Vehicle (MAV) – a small rocket designed to launch almost basketball-sized container back into Mars orbit. The third launch from Earth will be "Earth Return Orbiter" – to be sent to orbit of Mars and pick up the sample canisters. The samples once safely intercepted, it will be sealed within a biocontainment system and then be loaded into an Earth re-entry vehicle. The samples will re-enter Earth’s atmosphere and later crash land at a "designated site" in the United States before the end of the next decade. Scientists from around the world will be able to assess the evidence for prebiotic processes, past life, and/or extant life on Mars by characterizing the signatures of these phenomena in the form of structure/morphology, biominerals, organic molecular and isotopic compositions, and other evidence within their geologic contexts. David Parker said that it would be a tantalizing but achievable vision which will further give many good reasons to explore the deep space. He further stated, the chance to bring clean samples of the planet Mars back to Earth for examination with such advancement in facilities will answer questions of its past. All previous Mars missions have revealed ancient river and water streambeds which would support the appropriate chemistry that would be a key to a possible microbial life on Mars. A sample would provide a critical boost forward in the understanding of Mars’s potential to harbor life. Ben Boyes, Project Manager (Sample Fetch Rover Study) at Airbus, has complemented ESA and NASA for combining the expertise of both organizations for its ambitious and technologically challenging in nature, for making two rovers interacting together on Mars for the first time. Also for achieving a double first - launching from the planet’s surface and the in-orbit transfer of the samples, will make the study of Mars samples in laboratories on Earth possible. Patrick Lelong, Project Manager (Earth Return Orbiter Study) at Airbus, has stated Airbus's huge experience in different complex scientific exploration missions such as Rosetta, BepiColombo and Mars Express will be a great asset for because mission would be technologically very challenging, but the mere prospect of seeing a sample of Mars returning to Earth would be the driving force to succeed. At NASA, robotic Mars sample return missions have been seriously contemplated since the late 1970s (the time of Viking), but the cost and complexity of such missions have resulted in a continual postponement. But, in the year 2002, the concept of "Groundbreaking Mars Sample Return" was developed by Glen J. MacPherson under charter by Mars Exploration Program Analysis Group (MEPAG) to define sample return mission architectures of low cost and complexity. Because of revised U.S. Government budget priorities following 9/11 terror attacks, NASA was asked to re-examine its own priorities regarding missions as the high proposed cost of sample return were especially considered problematic. However, a study was conducted to use the 2009 Mars Science Laboratory mission to cache samples for or deliver them to the subsequent Groundbreaking MSR mission, but the findings suggested an increase in unacceptable cost and risk, and daunting technological difficulties, for one or both missions. Despite NASA getting US$ 20.7 billion as a part of 2018 budget, (US$ 1.1 billion above 2017) - the joint NASA-ESA statement of intent - can be stated as an offset mechanism to distribute the MSR costs with other competent space agencies and aerospace companies. He is a Marketing Professional at Cognitio Innovo, with a keen interest in technology-driven businesses. He is graduate in management studies (MBA) from the Institute of Management, Nirma University, Ahmedabad.